Everyone who knows me is also aware of the fact that my favorite programming language is Python. I wrote hundreds of thousands lines of code in Python, ranging from web apps to software running on embedded single board computers like the Raspberry PI. Due to its nature of high level and interpreted programming language, Python is still not present on true embedded microcontrollers, even if they are becoming always more powerful. 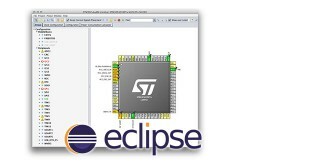 For example, the STM32 platform is a really cost effective family of MCU considering the feature it implements. But things are changing. Micropython is a really impressive effort from Damien George (and the community) to port Python 3.x to low cost MCU. μPython is not a simple one-to-one port of Python, but it's a complex effort to adapt the official CPython to hardware architectures with really low physical resources (especially RAM). The μPython project has also successfully raised for founds on kickstarter for two electronic boards: the PyBoard, a really simple prototyping board based on the STM32F4 family, and WiPy based on the CC3200 Wi-Fi chip from TI. 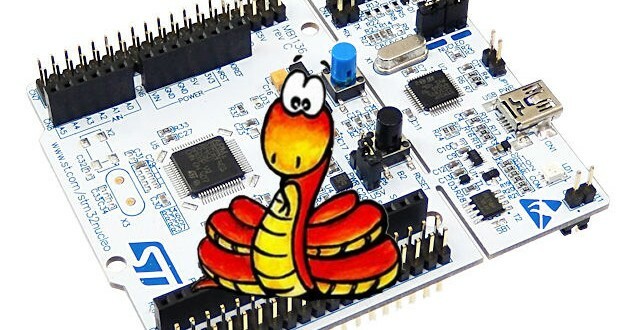 Being the PyBoard based on the STM32F4 family of MCU, and the HAL provided by ST, it's quite simple to adapt μPython to other boards with the same MCU, even to custom designed board. In this post I'll show you how to successfully compile μPython for the Nucleo-F401RE board, the one I've already used in my past tutorials. Since there is no official support for this board, I've forked the github repo and done all the necessary modifications. You can download it from my github account. You have a STM32Nucleo-F401RE board. You have a UNIX like based PC (both Linux and MacOS are welcome - It should be not too difficult to arrange my instructions to a Windows PC). if you need to install a complete GCC/Toolchain, you can follow this guide. You have successfully compiled OpenOCD (I suggest the latest 0.9.0 version) and properly installed it in ~/STM32Toolchain/openocd. At this point, official μPython documentation follows showing you how to flash the PyBoard using DFU mode (this is the way STM32 MCUs - and all ARM based MCU in general - can be flashed without using additional circuitry on the final board). 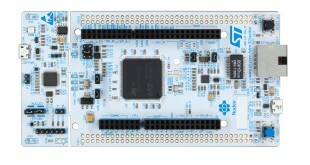 However, all the Nucleo boards provide an integrated ST-Link debugger. This means that there is no way (unless you decide to play with the pins exposed on the morpho connector) to directly program the target MCU using DFU protocol. For this reason, we'll use OpenOCD. Now that OpenOCD is connected to our Nucleo, we can transfer the generated binary to the target MCU. To do this, we need to send commands to OpenOCD via a telnet session. To test μPython you need a terminal emulator, like Kermit or PicoCOM. In UNIX like systems, ST-Link Virtual COM Port is usually mapped with a device name similar to /dev/tty.usbmodem1a1313. Check exactly the name in your case. If you have kermit, you can type the commands shown in the following image. As you can see, it is really simple to port μPython to a Nucleo-F4 board. This is mainly thanks to the excellent work done from the μPython community. But if you are interested to the full story, you can continue reading this tutorial. The information I'll give can be really useful if you need to adapt μPython to a custom board based on STM32F4 platform. 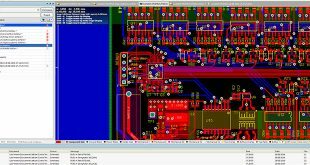 Let's me clarify once again: the process I'm going to describe is for STM32 based boards. For different architectures you have to play with μPython sources. Create a subdir inside the stmhal/boards with the name of your board (in our case, STM32F4NUCLEO). a file named mpconfigboard.h containing directive which describes your board (more next). a file named mpconfigboard.mk containing link to Alternate Functions (AF) tables and GNU LD configuration script. a file named pins.csv with the list of used pins (this depends on the hardware layout of your board). a file named stm32f4xx_hal_conf.h which contains the definition and import declarations for STM32Cube HAL (the one generated from STM32CubeMX tool should be sufficient). Let's analyze in depth these files. 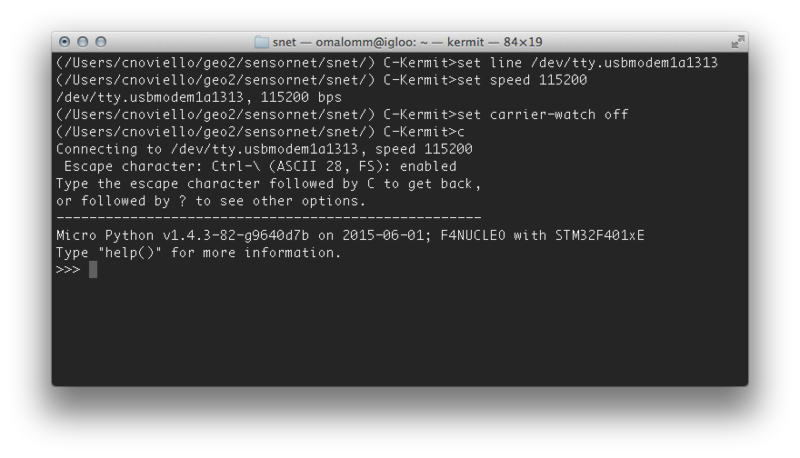 build-STM32F4NUCLEO/firmware.elf says to GDB to load the firmware binary (both code and debug symbols). Transfer rate: 23 KB/sec, 14367 bytes/write. Breakpoint 1 at 0x80440a4: file main.c, line 247. To do a step-by-step debugging you can use classical GDB commands like s(tep) to do step-in and n(ext) to do a step-out debugging. As I said before, STM32Nucleo doesn't provide support to external SD card like PyBoard does. This means that there is no direct way to upload source .py files and check for execution. There are only two options that came out from the box with standard μPython source tree. The first one is to use the REPL. However, this is quite inconvenient if you want to do serious things. The second choice is to use a convenient interface available in μPython that allows to remote execute commands on the target board from a PC. This tool is named pyboard and it's available inside the tools subdirectory in μPython main tree. Every time a file is transferred on the PyBoard, μPython does a soft reset. This option is really useful during the development process. However, this requires uploading again the program instructions every time the board is hard-rebooted. I introduced a third way to program our Nucleo board with μPython: a file transfer mode. What I've implemented is really simple. I've added another mode available in the REPL. Hitting CTRL+F puts μPython in file transfer mode. μPython waits for the name of the file, followed by CTRL+A character. When CTRL+A is sent to the REPL, μPython opens for creation the file in the /flash partition and starts waiting for all characters contained in the file, until another CTRL+A is sent to the REPL. When this happens, μPython close the file and starts waiting for another file name. μPython exits from this loop when a CTRL+C char is sent, and performs a soft reset. μPython return to point 2 until a CTRL+C is sent. In this way is possibile to save the python program inside the Nucleo flash. I've also implemented a way to delete files, simply adding a "-" before the file name. For example, to delete the file foo.py simply write -foo.py when prompted for filename. If you are curious about what I've done, you can do a git diff between my repo and the official one. However, the most of the job is done by the pyexec_file_upload() function in pyexec.c file. 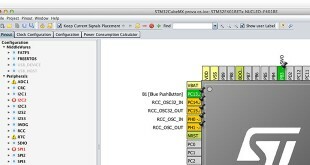 I just came by chance across your post about porting MicroPython to STM32 Nucleo-F4. Very interesting, and it provides several answers to interrogations I had right now. A few words about the context: I have developed a module for prototyping smart objects and more, which I plan to launch on kickstarter soon (la-bluefrog.io). I'm more a hardware guy (although I do program in C), but friends tell me Python is really cool and I'd love to support it. 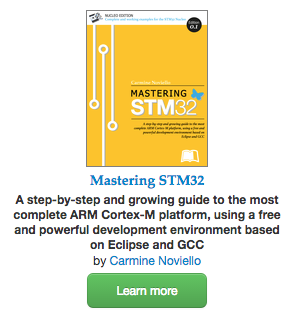 The MCU I use is the new STM32-L4. Since it's based on Cortex-M4 I'd been assuming a porting should be doable. Your post confirms this and provides interesting insights about the way to go. I was wondering if you would be ok to go a little bit further into that subject with me. Please mail me if so. I have managed to build the hex file for thE stm32 nucleo but when I flash it it using STM32 Link utility, nothing appears to happen. I get no prompts out the serial port. (I assume it is 115200). You you have a HEX or bin file that you know works?? Which kind of Nucleo are you using? I then programmed the bin file using STM32 st-link utility starting at address 0x08000000. After restart I still see nothing out the usb serial port of the of Nucleo-F401RE. What should I expect to see out the serial port? Is the baud 115200? I do know this board works as I have programmed other applications on it including using the serial port. Yes, baudrate is 115200 and it should appear the python REPL on the VCP. I suggest you to follow the debug instructions above to trying understand what's going wrong. Consider also that the first time you run micropython, it needs to create the internal filesystem in the flash. 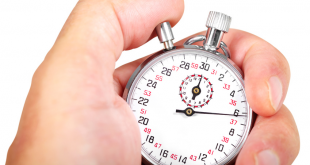 So, allow up to ten seconds before the REPL appears. Thanks. I really appreciate you help. But the hex file did not work either. Nothing comes out the serial port. I am using Hyperterminal for the serial port program, set to 115200, but no matter how long I wait I get no prompt in Hyperterminal. I even created an SREC file from your ELF file, hoping that would work. I didn't try debugging as you mention above as I do not have openOCD. 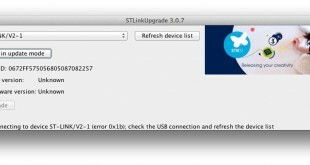 Is the problem I am having due to the ST Link Utility?? Is this the incorrect way of programming the nucleo board? and check if there is something with the VCP drivers in Windows. Did you solved the issue? I've modified the firmware. 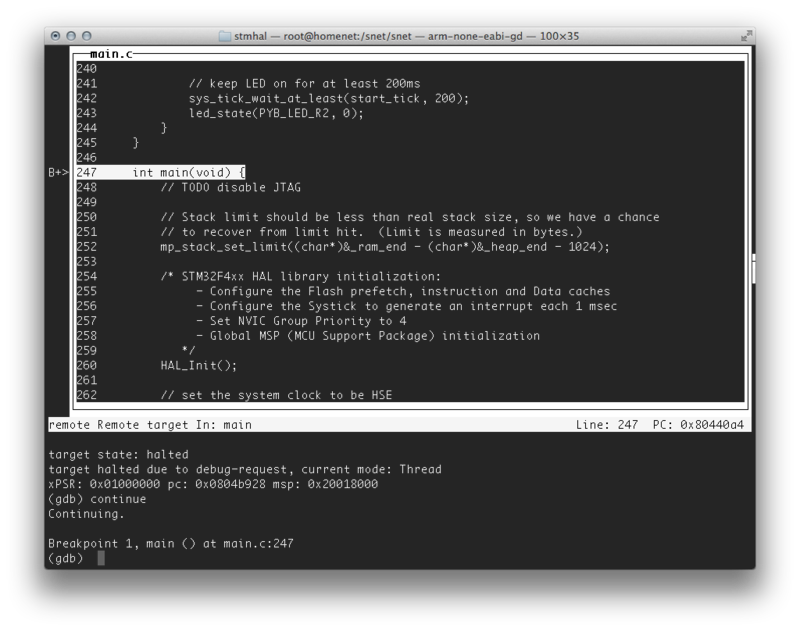 Now when boots, the LD2 LED blinks 5 times before the REPL appears. Try to upload this version and to see if the LED blinks. If so, something is wrong with the VCP. thanks. I upgraded the firmware. Do you have a link to the new modified software? Thanks. I downloaded the new hex file but it is identical to the first one. Thanks for the new file, but this version does not flash any LEDs nor have REPL appear on USB Com Port. Was going to order a pyboard, just stumbled on your work today and I have 2 NUC 401 board on hand. Just thought I would mention, the fastest way to get it running on Windows, it to use the STM DeFuSe Demo, connect to the NUC, load the hex binary, then use program and verify. Already had DeFuSe so it took about 2minutes to get up and running. Again, neat project! I may following your post make a target definition one of the NUCLEO144 boards I have. Thank you for very good job, I've successfully programmed .hex in my NucleoF401 and all work perfectly. I've started to play with REPL (Windows with Putty on STLinkV2 VCP). My question is how can edit main.py to use your file transfert (CTRL+F - CTRL+A) method ?